The Quileute Natural Resources Mission: Our goals are to provide treaty year-round fishing opportunity within the Quileute Usual and Accustomed Treaty Area for Quileute Tribal members, for commercial, ceremonial, and subsistence purposes; and to assure primary hunting and gathering rights can be exercised within the Treaty Ceded Lands. Our staff will work with the elected Quileute Natural Resources Committee, a policy body, and the elected Quileute Tribal Council, the oversight body, to define and implement responsible management, including development of tribal ordinances and regulations; planning for resource management within state, federal, and tribal resource management entities; and design/implementation of of habitat management, protection, and restoration within our Treaty Areas on the land and in the ocean. 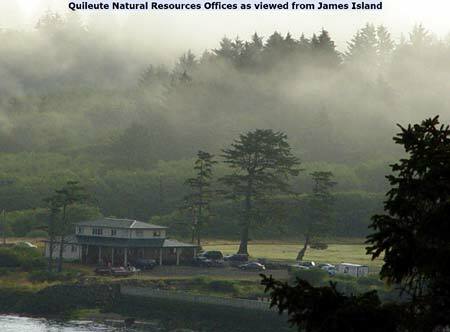 The Quileute Tribe is a member tribe of the Northwest Indian Fisheries Commission. A summary of our activities are included in a brochure. To download the PDF, click here. Current fishing regulations for tribal members are available via PDF on this page.